Railpictures.ca - Rob Smith Photo: A late RLHH 595, now RLHH 597, approaches Blossom Avenue in Cainsville with QGRY 6908, RLHH 3404, RLHH 3049 and QGRY 2301. The QGRY 2301 had been brought up to Brantford by RLHH 598 the day before, and was most likely headed to the Imperial Oil refinery assignment in Nanticoke. It’s unusual to see four units on 595/597. | Railpictures.ca – Canadian Railway Photography – photographie ferroviaire Canadienne. 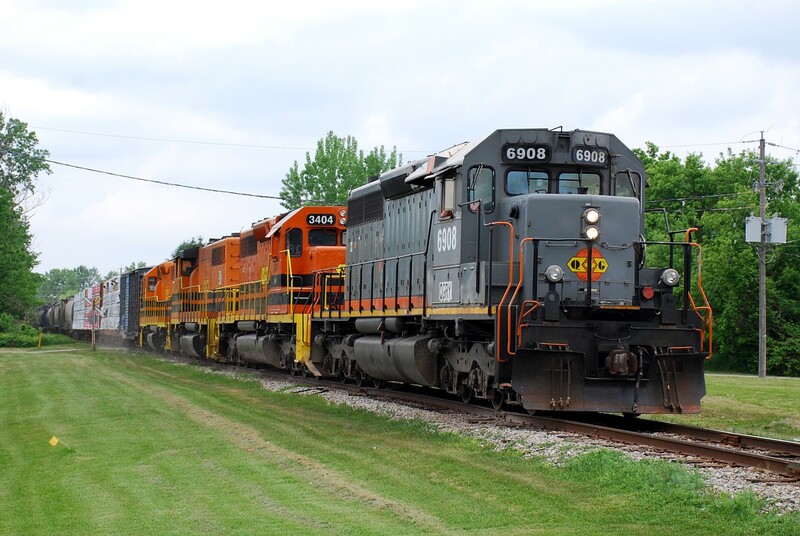 Caption: A late RLHH 595, now RLHH 597, approaches Blossom Avenue in Cainsville with QGRY 6908, RLHH 3404, RLHH 3049 and QGRY 2301. The QGRY 2301 had been brought up to Brantford by RLHH 598 the day before, and was most likely headed to the Imperial Oil refinery assignment in Nanticoke. It's unusual to see four units on 595/597. With the right unit in the lead too.